Christmas Has Come Early! Our glass artisans at ELEV8 Premier Studios have produced a 100% pure convection, all American made Schott Borosilicate glass (minus screen), portable and durable Vaporizer. No batteries needed! Easily used with dry herbs and concentrates, or if you're feeling frisky, both at the same time! The kit will come with glass stem, 14mm male water pipe attachment, flavor disc (for concentrates only), 19mm-14mm water pipe adapters, extra screens, sick clip, and ELEV8R Heater! Ride the Wave! Giveaway details tomorrow! Bananiq, asdf420, MoltenTiger and 24 others like this. Makes sense why I couldn't find an upcoming thread on here...it hadn't been made yet haha. Saw your post about this on reddit and I'm definitely excited. Can't wait for more details and reviews. Edit: I'm most interested in the "flavor disc". The picture reminded me a lot of the Healthstone style puck that I've always been curious about. Seemed like such a cool little product but the cost of the puck and their pipes/slides were always a bit off putting. WakeAndVape, JCharles, 7thFloorVapes and 5 others like this. Awesome, am excited to check this out. I have been using a straight glass straw and torch, this sounds ideal for on the go dabs. JCharles, 7thFloorVapes and StormyPinkness like this. Sounds interesting ... I am wondering what the ELEV8R heater is and how the Vape works with that heater. MoltenTiger, JCharles, HD Springer and 2 others like this. MoltenTiger, Alexis, JCharles and 3 others like this. I like some 7th Floor vapes so I am anxious take a look too. MoltenTiger, JCharles, 7thFloorVapes and 2 others like this. Vaporgenie all glass kind of portable? CarouselOnFire, johnnyCanuck, 7thFloorVapes and 4 others like this. Looks like a more artistic and chunkier vapocane, which is an awesomely underrated vape and my daily driver for the past year. If it is performs like that and can get around the issue of the glass melting near the tip I'm in! grokit, DirtyD, JCharles and 5 others like this. Would love to rip it through a bong!!! I assume it’s used with a torch?? MoltenTiger, Morty, JCharles and 3 others like this. Can you link us up to a location? AtomicPB and 7thFloorVapes like this. MoltenTiger, mikeb6109, Prolusio and 11 others like this. Is it a super long power cord or solar powered? 7thFloorVapes and steama like this. I am assuming that the "elev8r heater" will probably be a torch, but the word "heater" is throwing me off. MoltenTiger, Diggy Smalls, Morty and 9 others like this. Have they released a price? 7thFloorVapes, Tiny88, JCharles and 3 others like this. Summer, 7thFloorVapes, Prolusio and 9 others like this. 2 to 4 hits from a quarter gram? Huh? I know that this is dependent on how big of a hit you take but from my experience, that many hits sounds very much on low side, eh? I take average size hits. I vape every other night and on the nights that I vape, I take no more 3 hits and a gram lasts me a little over a month. I'm way to lazy to do the math but that comes out to way many more hits than what is being reported here or is there something I'm missing? MoltenTiger, 7thFloorVapes, WakeAndVape and 4 others like this. Thanks for the vid, @antispleen. Mystery solved I guess. The elev8r "heater" is a boro heat exchanger similar to the Gn0me and Mobius Flowerpot. Morty, 7thFloorVapes, Prolusio and 5 others like this. Looks awesome - nice big bowl (.25g) and all glass will produce huge flavouful hits. I think this will be an even easier transition for a heavy smoker to transition to vape life. I can see them using a DynaVap on-the-go for a familiar feel and punch in a micro dose package. 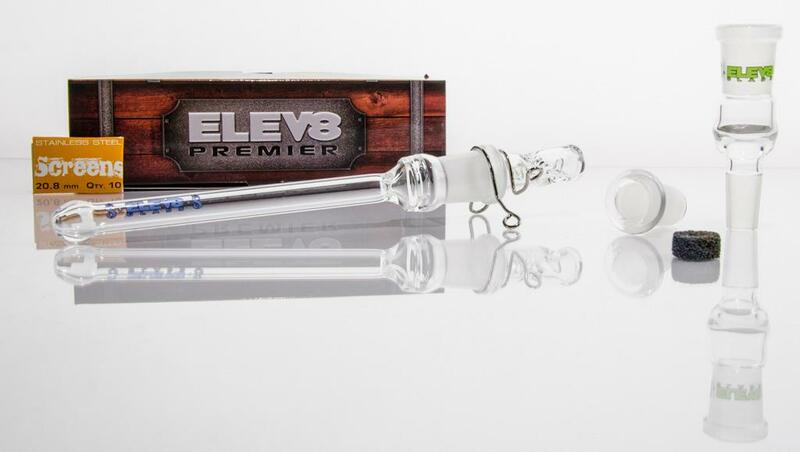 And the Elev8r to get a huge rip with a bit more of a sesh feel with a face melting bowl size. Stoked to try it. Hope I made the cut for tester. 45 seconds on the torch is kind of rough though. MoltenTiger, Summer, 7thFloorVapes and 4 others like this. Oh man, I have to check this out! I was just wondering why I hadn’t seen more dry herb vapes that use a nail style heating element. 7thFloorVapes and StormyPinkness like this. Looks cool, i love the gn0me style heaters,being messing with them myself for quite a while. What i like about 7th floors creation is the minimized concept ,only reloading would require some kind of tool. Is the heater boro or quartz ? Got one on the way, should be here monday...very stoked...i hate waiting for mail though! mikeb6109, Alexis, KidFated. and 9 others like this. Summer, StormyPinkness, 7thFloorVapes and 1 other person like this. I have owned almost every butane powered vape produced (the ones I feel worthy), and this is soooo intriguing. I have been waiting for one to interest me for a while... and the ELEV8 looks f**kin' AWESOME! How long does it take for an order to be filled? Very interested, but the 45 seconds heat up time seems a little extreme, and do we have to use such a big torch? Not very likely that you would be using outside the home. Would nice to have some indication that the vape is to temp. Maybe something in the elevator part that changes color when it is ready perhaps? Would love to test it and give you my feedback! Alexis, invertedisdead, 7thFloorVapes and 1 other person like this. Do you think the Elev8 heater will be compatible with the @Pipes induction heater? Yes looks like a cross between a Vapocane and a Supreme, the design of the first and the heat retention of the second! Can't find a closer pic of the heater... is there one anywhere?